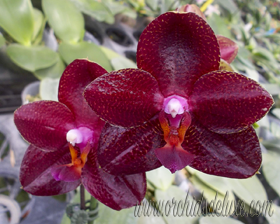 Here you will find the different species and new orchids (hybrids) from all over the world. We try to deliver you a product that matches the highest requirements. That is why we do offer a service where you can pick your own plants. You place an order! (Pictures without an order will not be send). In the comment field of your order you can request for pictures. What we will do is we will select two plants for you, from each plant we will make 3 pictures, the plants will be marked one and two. You select the number of the plant and confirm us the name and the number. The other option is to come over and select your own plant. This is only possible on an appointment basis. If there might be questions or you have special request’s or looking for something special, please do not hesitate to contact us. Maybe the plant you are looking for is already in our collection but too small for sales for instance.